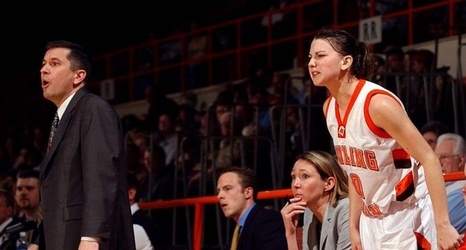 BOWLING GREEN — Five individuals will go into the Bowling Green State University athletics hall of fame this fall, the school announced on Friday. Kate Achter, shown in 2014 as a St. Bonaventure assistant, is now the head coach at Loyola University in Chicago. Clay High School alumnus and former BG basketball star Kate Achter is among the field, which is the school’s 52nd hall of fame class. Achter is joined by her teammate, Liz Hoenegger, former football player Cory Lichtensteiger, former wrestler John Smith, and Ron Zwierlein, who was a player, coach, and director of athletics in his time at BGSU.